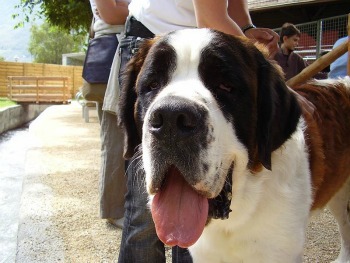 Originally bred as working dogs, the Saint Bernard was soon discovered to be a great rescue dog. Tales of Alpine rescue made them legendary. They are huge, weighing anywhere between 140 and 264 lbs and standing a good 3 feet off the ground, but despite their massive appearance they’re quite friendly and docile. However, like any other dog breed, they also need to be trained and taught proper manners, or you’ll have adopted a massive bundle of mischief. Their coat can be either smooth or rough, and if smooth it is close and flat. On the contrary, with rough coat it can be dense, flat, and denser along the neck and legs. The dogs can be either white with a hint of red or sometimes they can be mahogany brindle with the touch of white. You could find black patches around its face and ears and their eyes are usually brown or icy blue. Their tails are really cute, long and furry, hanging low and slightly turned up. With looks to kill, they are certainly the best dog for your household. This breed is very friendly. However, like other dogs they also need to learn socialization skills, and in order to do that they must be around other animals and people. This will simply make them well rounded and accepting. However, if you are wondering how to socialize your naughty Saint Bernard, you can take it to puppy obedience classes. This is where he will easily learn the basic skills and also learn to obey you as master. Besides he will also learn to behave around other dogs. As he is large dog, he must learn to stay put and not jump to any strangers as this may even hurt a grown adult. Only after he has learned to behave should he be allowed to go to a dog park or areas where he could socialize with people and dogs alike. One of the best things about this breed is they are fond of children. If you have any children at your home, they are surely to find a great playmate with this dog. Though they must be taught to be careful about their body weight around the children, otherwise he may unknowingly hurt a small child. They are also pretty loyal and are always at their four paws to help and please their owner. Although they are not at all aggressive unlike other big dogs, you must show them who the boss is, from day one. Given their size and their fetish for dominance, they can easily wrap you around their paws if you cut them slack. When faced with strangers, most of the time they just bark, but if not trained well, your fluffy friend can pin your guest to the floor with his sheer bulk. However, a Saint Bernard can also be a great watchdog if given the necessary training. Their huge size and growls combined are enough to scare an intruder and make him or her run for their lives. Interestingly though, Saint Bernards don't get into turf wars with other dogs, irrespective of gender, they are more keen on hanging out and making friends. A word of caution if you have other small pets at your home - be extra cautious when they are around him because more often than not, even if he isn’t a threat his bulk definitely is. It’s not only the alpine folklores that made the breed a legend, there are numerous stories found all around the world making Saint Bernard a hero and a savior. One of the most famous stories being the recovery of Manchester United football club from financial ruin by the saint Bernard of famous Harry Stafford. Around the time, the club was facing bankruptcy, the captain Harry Stafford showed up with his dog, a great Saint Bernard. One of the club’s patrons so liked the dog so much, he offered a price for it to the owner. Harry refused to sell the dog but managed to persuade the brewery owner, J. H. Davis to buy the club instead. If that’s not a story fascinating enough, who’s not acquainted with the famous Beethoven? 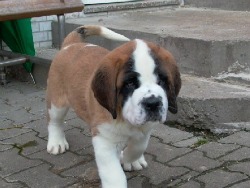 There’s a five movie series on a Saint Bernard named Beethoven, which also made the breed quite famous indeed.